is a USDA Licensed Breeding Facility. 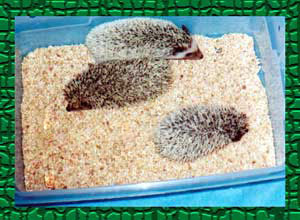 we have been breeding African Pygmy Hedgehogs since 1994. We have always strived to select our breeding stock for impeccable temperament and personality. Our foundation animals have been carefully chosen from some of the finest strains of hedgehogs nationwide. We are also COLOR breeders. 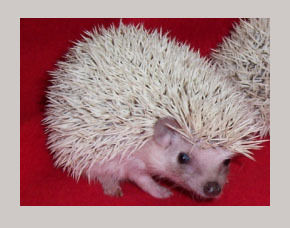 Our herd is on the cutting edge of the latest hedgehog color mutations to the pet trade! We are especially proud of our pinto strain. These flashy patterned animals are each unique. They range in pattern intensity from lite pintos to our fabulous high WHITE strain which we affectionately call TOBIANO PINTOS. 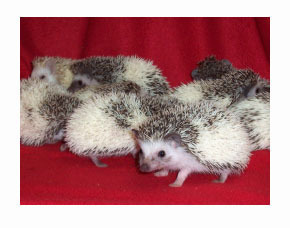 was the first to breed this variety of pinto hedgehogs. We are responsible for coining the name “TOBIANO” which originates from the horse world. After years of selective breeding for this gorgeous color trait, we brought our first TOBIANO PINTOS to the public in 2002. 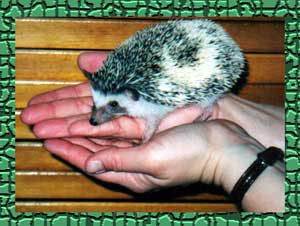 The importation of wild caught hedgehogs into the United States was banned in 1994. 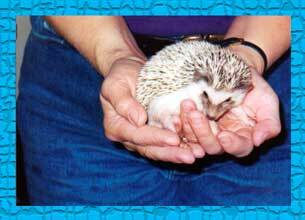 Since then, the hedgehogs available to the public have come about through domestic breeding. Now that we are in the 21st century, our baby hedgehogs are many generations removed from their wild ancestors. As our hedgehogs have become more and more domesticated, exciting color mutations have cropped up. These aberrant colored animals would not usually survive when occurring i the wild. Their lack of camouflage would make they easy targets for predators. However, in captivity, animal husbandry allow us to develop the gene pool and “fix” the genetics which brings us these beautiful new colors of hedgehogs. The same scenario which we are now experiencing with hedgehogs happened in the past with other animals. In the 1930’s the original imported wild strain of Syrian hamsters was the common golden variety. Today hamsters are available in a myriad of colors and patterns… All because of the early pioneers of hamster color genetics. A similar situation occurred in the 1950’s with chinchillas and again in the 1970’s with Mongolian gerbils. We are very excited to be an integral part of the helping to bring the African Pygmy Hedgehog out of the “monochrome” wild world, and into the “Kodachrome” future of the domestic hedgehog! Gary studied genetics in college, the technical aspects of color breeding really gets him enthusiastic. Vickie is just plain passionate about her gorgeous colored baby hedgies! The breeding of fancy colored hedgehogs is a relatively new area of expertise. Many of the hedgehog books on the market don’t even picture hedgehogs other than the common variety. Most pet stores have never seen a colored hedgehog! We are thrilled to be so close to the cutting edge of the latest hedgehog color mutations. we will use the remainder of this page to give you a tour of the WONDERFUL RAINBOW OF HEDGEHOG COLORS which we are breeding and have available for sale on a regular basis. Before we start to show you our hedgehog COLORS … we would like to discuss the complex issue of hedgehog color classification. During the relatively short period of time that hedgehogs have been kept as pets, many groups and individuals have endeavored to formally classify all of these colors. And there has been some disagreement. Several organized groups have come (and many of them have gone) without a 100% consensus on how to classify Hedgehog Colors. Establishing an iron clad “STANDARD OF PERFECTION” for hedgehogs like the AKC has for dog breeds, and the AMERICAN POULTRY ASSOCIATION has for domestic fowl, has been somewhat elusive. Possibly in time, hedgehog experts will be able to lay aside their differences and personality clicks in order to arrive at a universally agreed upon standard for breeding and showing hedgehogs, similar to what THE AMERICAN QUARTER HORSE ASSOCIATION has for equines. 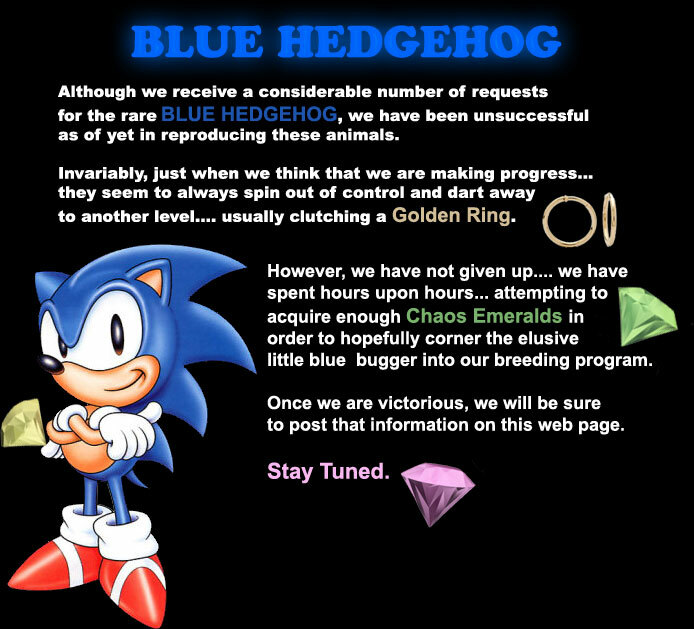 In the mean time, you may find some confusing and contradictory information about HEDGEHOG COLORS on the Internet. Here at Vickie and Gary have attempted to simplify the classification of our HEDGEHOG COLORS for the benefit of our PET HEDGEHOG CUSTOMERS. Hedgehogs are now being bred in over 30 specific colors. Some of the differences are very subtle and take a trained eye to recognize. For example, the standard wild color (AGOUTI) hedgehog has been bred in many slight shade differences.!!!! There are TRUE SALT & PEPPERS, GRAYS, BROWNS, CINNAMONS, CHOCOLATES….the list goes on. Then we have the ALGERIAN and WHITE BELLIED issue. 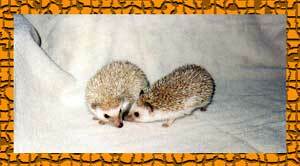 Our modern pet hedgehog is the result of a cross between these two distinct subspecies of African Hedgehogs. Case in point: the ALGERIAN CINNICOT COLOR is completely different from the WHITE BELLIED CINNICOT colored hedgehog! VERY CONFUSING TO THE NOVICE HEDGEHOG OWNER!!!!! 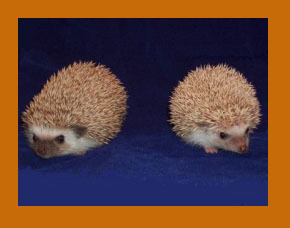 has attempted to quell some of the confusion by developing our own simplified HEDGEHOG COLOR classification system. Over the years, our PET HEDGEHOG customers have thanked us for this! 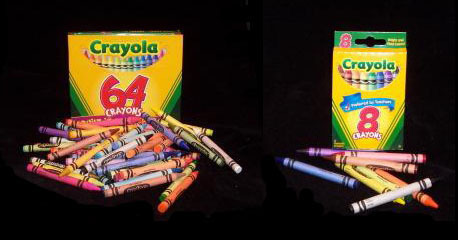 Basically we have scrunched the BIG 64 Color Crayon box into an easy to understand !8 Color box!!!!!!!!!! Wild Strawberry, Magenta, and Violet Red…..become plain ol’ RED!!!! OUR EMPHASIS IS ON THE BREEDING OF FANCY COLORED HEDGEHOGS AS COMPANION PETS… AND OUR COLOR DESCRIPTIONS HAVE BEEN DESIGNED TO MAKE IT EASY FOR OUR CUSTOMERS TO DISTINGUISH THE VARIOUS HEDGEHOG COLORS/PATTERNS WHICH WE OFFER FOR SALE ON A CONSISTENT BASIS. This is the common wild color of hedgehogs. It is technically “Aqouti”, meaning that there is a mix of chocolate, tan, & cream colored quills. Some call this color “STANDARD” and distinguish between various shades of brown. To keep it simple, we refer to all of our Standard Hedgies as SALT & PEPPER. The SALT & PEPPERS have beautiful racoon like masks, dark eyes, and dark ears. The quills are banded. breeds SALT & PEPPERS in various shades, including both Dark and Lighter varieties. Some have more chocolate colored masks, others are deeper brown. TO THEIR ENDEARING MASKS AND FACIAL FEATURES! CINNAMON hedgehogs are a lighter, creamier version of the SALT & PEPPER. The shade of CINNAMON can vary from almost chocolate to very pale. The CINNAMONS retain the mask, dark eyes, and muzzle features…although many animals have more of a liver color to their nose and face. Both our CINNAMONS and SALT & PEPPERS sell for the same price. We distinguish the two STANDARD varieties in an attempt to match folks up with their preference to either darker or lighter common colored hedgehogs. 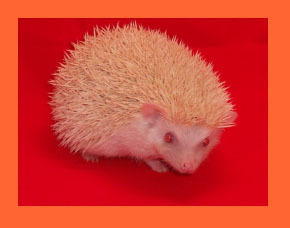 ALBINO Hedgehogs were the first domestic color mutation of hedgies. 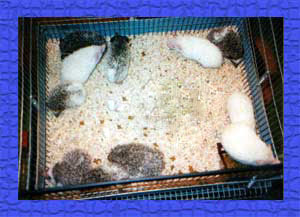 ALBINOS totally lack color pigment. This results in them exhibiting gleaming white quills, pink skin, and pink eyes. Those Pink Eyes…you either love them or you don’t. Here at , we LOVE OUR LITTLE ALBINO BUDDIES.!!!!!!! 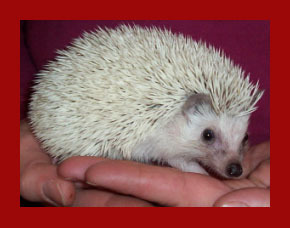 Contrary to some myths, there are no adverse health or longevity issues related to ALBINO hedgehogs in captivity. In the wild they would have a difficult time surviving due to their lack of camouflage. ALBINOS are your entry level hedgehog price wise. Since the ALBINO gene is present in most of the other color mutations that we breed, we tend to have ALBINO babies on a consistent basis. The SNOWFLAKE color is actually a PATTERN. A hedgehog’s quills are normally banded. The SNOWFLAKE color mutation intersperses solid white quills amongst the animal’s base color. It is similar in appearance to a lady who frosts her hair. VERY PRETTY!!! SNOWFLAKE is the first non-standard color variety that we bred at . Most SNOWFLAKE hedgehogs typically have 50-90% WHITE QUILLS. Most of our animals will average about 75% white quills when they mature. SNOWFLAKES tend to lighten up in color as they grow. Many are born looking like a typical STANDARD hedgehog. As they get older they go through a “quilling” stage and some of the new quills come in solid white. Although most baby SNOWFLAKES can be distinguished at an early age by a trained eye, others cannot. Some litter mates will mature into SNOWFLAKES, while others will remain STANDARDS. Time (and knowing the pedigree of the animal) will tell. Determining how heavy the snowflaking will be is a waiting game. Note the photos above: The litter of hedgies on the left are all 8 week old SNOWFLAKES. The center animal looks more like a SALT & PEPPER at this age. The photo on the right is the same animal just one month latter!!!!!! No doubt, we have sold some SALT & PEPPER babies in the past who latter “became” SNOWFLAKES!!!! 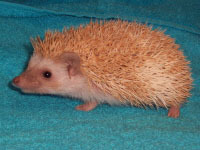 The CHAMPAGNE is one of several colors of very pastel hedgehogs. We like to think of them as BLONDS. They have a very pretty dilute base color of creamy tan quills. The mask and facial features, if present, are very opaque and dilute. In general their face and nose is liver in color. The CHAMPAGNES do not have dark eyes….but they are not pink like the ALBINOS either. The eye color is a rich RUBY RED that appears almost black until the light hits them just right! CHAMPAGNES are not a common color, as the trait is recessive. This color is very unique. Some have described it as a “rusty version” of a CINNAMON. Since these animals look like they are a cross between a CINNAMON and an APRICOT, the name “CINN-ICOT” was coined early on by hedgehog breeders. CINNICOTS are a color all of their own! Some CINNICOTS lean more towards the CINNAMONS. They have dark masks and very few orange quills. Others can exhibit more of the APRICOT traits…having lots of glistening orange quill color!! Since there is quite a range of shades in the CINNICOT color, they can come in either DARK EYED or RUBY RED eyed varieties. The animals leaning more towards the CINNAMON standard color tend to have dark eyes and more pronounced masks. Those hedgehogs which fall closer in the APRICOT color spectrum usually have more diluted facial features, ruby red eyes, and an abundance of gorgeous ORANGE colored quills. The two hedgehogs on the left are litter mates. Both brothers. Both CINNICOTS. Note the difference in the color shade. The one on the left is lighter, and in real life exhibits more APRICOT quills. The one on the right is darker, even in the muzzle & ears. (The fella on the right is actually a CINNICOT PINTO...notice the nickel size white patch on his left side). We have raised a wide range of “COTTYS” over the years. CLICK HERE TO VIEW MORE IMAGES OF CINNICOTS. OAK BROWN is a relatively new color for us at . We began selling our first OAK BROWNS in 2005. These beautiful animals are a tad lighter than a CINNAMON…but much darker than a CHAMPAGNE. And like most hedgehog colors, the OAK BROWNS can come in a wide range of shades. (note the color difference between the two brothers on the left). OAK BROWN hedgies have dark eyes and retain the mask and facial features. The APRICOT is a pretty animal with light orange quills blending with beige. Their eyes are RUBY RED colored. They are distinguished by their pink noses and lack of a mask on their face. APRICOT hedgehogs are difficult to find…but we breed them on a regular basis!!! We love our APRICOTS to pieces….and our customers have discovered how wonderfully unique they are too! 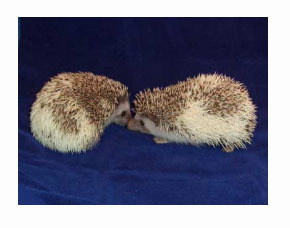 The photo on the right is another one of our APRICOT hedgehogs…. showing some of the subtle differences in the shade that we breed them in. APRICOTS cover the spectrum from RICH ORANGE to a pretty pale PEACH color. 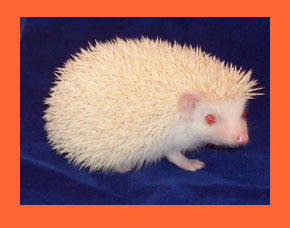 DARK EYED WHITE hedgehogs are very rare!!!!!!! But through years of professional breeding, has them on a fairly regular basis!! DARK EYED WHITES are actually the ultimate SNOWFLAKE hedgehog. And true to the SNOWFLAKE pattern, some DARK EYED WHITE babies are born with darker banded quills mixed in. They generally loose them before reaching adolescent age…resulting in the gleaming white animal pictured here! There are several “shades” of DARK EYED WHITES. Differences generally involve skin, nose, and ear color…as well as the base color of the few colored quills mixed in. 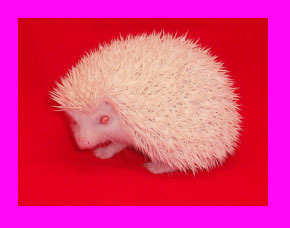 DARK EYED WHITES are the answer for folks who desire a WHITE hedgehog, but don’t like the PINK skin and eyes of the ALBINOS!!!! 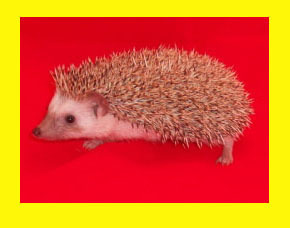 If you have been wanting a unique and rare colored hedgehog…. check out our DARK EYED WHITES!!!!!!! The PINTO color in hedgehogs is actually a PATTERN and not a color. PINTO refers to the patches of WHITE markings which randomly occur on the body of the hedgie. 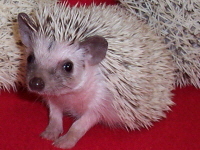 Just like PINTO horses, PINTO hedgehogs are each unique. 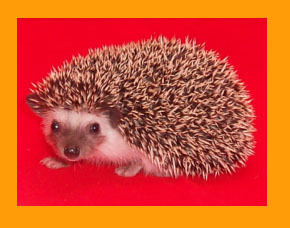 Here at , we are well know for our famous strain of PINTO hedgehogs! We were the first to breed, raise, and sell the TOBIANO variety of PINTO hedgies. We are even the originators of the coined name “TOBIANO”, which is taken from the world of PINTO and PAINT horses. TOBIANO refers to a HIGH WHITE and extremely flashy PINTO patterned animal. The PINTO pattern can consist of varying amounts of WHITE markings. Some animals have only a few small patches of WHITE COLOR. The animal on the left displays a medium amount of PINTO color. Some breeders will brag about a nickel size white spot on their animal. Although this technically makes them a PINTO… is known for much flashier and more attractive markings!!! SALT & PEPPER PINTOS. 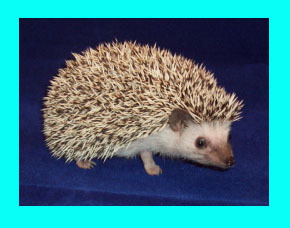 However, any hedgehog background color can come in the PINTO pattern. We regularly raise: CINNAMON PINTOS (like the fella pictured here). We also breed CHAMPAGNE PINTOSS, CINNICOT PINTOS, OAK BROWN PINTOS, and even APRICOT PINTOS.! The APRICOT PINTOS look like little “dreamcycles” due to their subdued pastel colors! And although the PASTEL colored PINTOS don’t have a dramatic high color contrast, their rare soft subtle beauty puts them in high demand. And if that isn’t exciting enough….on occasion we even have SNOWFLAKE pattern animals who are PINTOS!!!!!!! And yes…you got it…the SNOWFLAKE PINTOS can be: SNOWFLAKE PINTO OAK BROWN, SNOWFLAKE PINTO CINNAMON,….etc…you get the idea!!! THIS IS WHERE IT GETS REALLY EXCITING!!!!!!!!!!!!! But our real passion is for our HIGH WHITE TOBIANO PINTOS!!!! 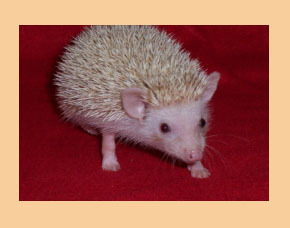 CLICK HERE FOR LOTS MORE IMAGES OF OUR PINTO HEDGIES! PLATINUM hedgehogs are actually a specific type of DARK EYED WHITE. And as we previously explained, DARK EYED WHITES are the ultimate SNOWFLAKES. The PLATINUM color is an animal with 99.99% solid white quills…they are essentially devoid of any banded quills. Their skin is very dark, can even be JET BLACK. They have BLACK NOSES, dark muzzles and ears. The contrast against the WHITE quill color is stunning!!! We list PLATINUMS here as a separate color category because they are extremely rare. When we have them, they are generally a tad pricier than the other DARK EYED WHITES. 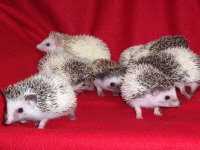 We have included some other pictures of PLATINUM hedgehogs with the DARK EYED WHITES. as we are our exotic colored ones. as well as ones that will steal a pet owner’s heart! 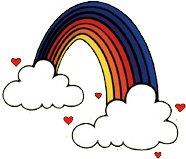 We have designed this page to be a guide to the rainbow of colors which we produce in our hedgehog herd. We generally have baby hedgehogs available on a consistent basis. We are sorry… but not all colors are always available. Call us for our current inventory of baby hedgehogs. if the color which you desire is currently out of stock. 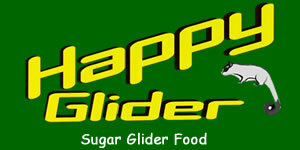 We maintain accurate pedigrees on all of our breeding animals. This helps us to professionally manage our breeding program. 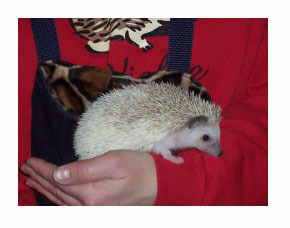 It also ensures our customers that their pet hedgehog is of the highest quality! YOU CAN CHECK OUT OUR WEB PAGE TITLED “VICKIE’S BABY ALBUM”. 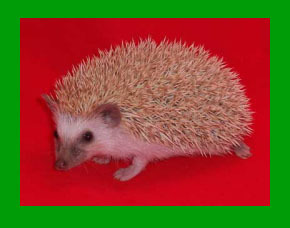 check out our HEDGEHOGS AVAILABLE web page. It is NOT NICE to steal somebody else’s hard work!!!!!!! !